Arcam introduces the ‘new and improved’ irDAC II | What Hi-Fi? 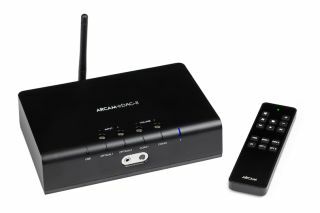 One of the highlights of the Arcam stand at CES 2016 is the latest version of its irDAC with digital preamp, headphone amp and Bluetooth receiver. It's due on sale soon for £495. Major upgrades on the MkII model include new internal circuits, a new headphone amplifier stage, new Bluetooth aptX input and the adoption of the ESS ES9016 Sabre DAC. The headphone output stage has been taken from the company's flagship A49 amplifier and can, claims Arcam, drive even the most demanding of headphones. And its engineers have worked “obsessively” to further reduce jitter, focusing on isolation of the digital and analogue stages, ultra-low noise power supplies and a direct couple signal path. Physical inputs include one asynchronous USB, two SPDIF and two optical connections and there's wireless streaming via Bluetooth. All inputs can be controlled using the IR remote supplied. There's full support for 24-bit/192kHz and DSD128 high-resolution music files. The USB input can support sample rates up to 384kHz, the coaxial input up to 192kHz and the optical connection up to 96kHz. A smart cast-aluminium, anti-vibration case completes the package.